Team Suzuki Press Office – June 14. Some 36,000 spectators braved harsh and wet conditions at Maggiora Park for the Grand Prix of Italy and round nine of 18 in the FIM Motocross World Championship today as Rockstar Energy Suzuki Europe’s Jeremy Seewer scored his second podium finish in the MX2 class on his works RM-Z250 with third place overall. Around the throttle and brake-hungry hills of the hard-pack Italian course the fabled track was a technically-straightforward challenge but some of the slippery zones of the soil had to be handled with care. Mistakes by some key Grand Prix stars proved costly at the event that pulled half of the 2015 calendar into the history books. Seewer placed his RM-Z 14th into the gate on Sunday as dark skies had already coated the venue with copious rain. The Swiss was unlucky on Saturday to suffer a collision with Petar Petrov on the first lap of the qualification heat race and had to pick-up his bike, roll-back down one of the Maggiora slopes and get back into the fray. He recovered from almost last place to 14th. 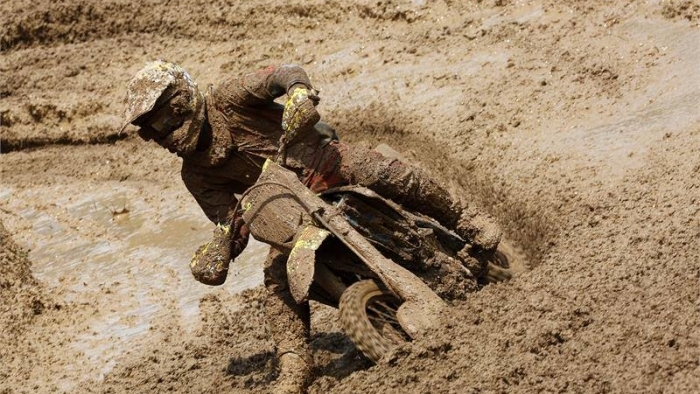 In a slimy and mud-drenched first moto he made a great start through the Italian slop and settled into a position trying to shadow Tim Gajser for third place. It was mostly a static affair with the single drying line the only reliable guide for the riders. Seewer kept ahead of Valentin Guillod and then Brent Van Doninck to make sure of fourth place. For the second race the track had continued to dry, but away from the principal lines, there was a bulge of excess soil that could quickly slow any progress. After five laps Seewer overtook Benoit Paturel for third place and then held the ranking for the rest of the race. He weathered attention from Max Anstie in the final two laps but was able to confirm a 4-3 and the second GP champagne spray of his career. Seewer now totals 246 points in the MX2 standings in just his second season in the category. He needs a further five to move into the top-five. A regular ADAC MX Masters German Championship campaigner and confident winner of the previous round at Bielstein, he will be an easily-recognisable figure at Teutschenthal next weekend for round 10. He will be joined by EMX250 riders Brian Hsu and Bas Vaessen as the feeder series for Grand Prix restarts for the fifth round of nine. MX2 Moto1: 1. Aleksandr Tonkov (RUS, Husqvarna), 35:43.948; 2. Jordi Tixier (FRA, Kawasaki), +0:10.152; 3. Tim Gajser (SLO, Honda), +0:19.927; 4. Jeremy Seewer (SUI, Rockstar Energy Suzuki), +0:43.043; 5. Brent Van doninck (BEL, Yamaha), +1:20.365; 6. Jeffrey Herlings (NED, KTM), +1:25.800; 7. Petar Petrov (BUL, Kawasaki), +1:29.160; 8. Julien Lieber (BEL, Yamaha), +1:35.621; 9. Vsevolod Brylyakov (RUS, Honda), +1:37.483; 10. Samuele Bernardini (ITA, TM), +1:38.710. MX2 Moto2: 1. Jeffrey Herlings (NED, KTM), 34:14.548; 2. Tim Gajser (SLO, Honda), +0:01.424; 3. Jeremy Seewer (SUI, Rockstar Energy Suzuki), +0:03.496; 4. Max Anstie (GBR, Kawasaki), +0:05.292; 5. Benoit Paturel (FRA, Yamaha), +0:27.111; 6. Brian Bogers (NED, KTM), +0:39.218; 7. Brent Van doninck (BEL, Yamaha), +0:46.169; 8. Aleksandr Tonkov (RUS, Husqvarna), +0:54.992; 9. Julien Lieber (BEL, Yamaha), +0:57.393; 10. Samuele Bernardini (ITA, TM), +0:58.765. MX2 Overall result: 1. Tim Gajser (SLO, HON), 42 points; 2. Jeffrey Herlings (NED, KTM), 40 p.; 3. Jeremy Seewer (SUI, Rockstar Energy Suzuki), 38 p.; 4. Aleksandr Tonkov (RUS, HUS), 38 p.; 5. Brent Van doninck (BEL, YAM), 30 p.; 6. Max Anstie (GBR, KAW), 27 p.; 7. Julien Lieber (BEL, YAM), 25 p.; 8. Petar Petrov (BUL, KAW), 24 p.; 9. Benoit Paturel (FRA, YAM), 22 p.; 10. Brian Bogers (NED, KTM), 22 p.
MX2 World Championship Standings (after 9 of 18 rounds): 1. Jeffrey Herlings (NED, KTM), 398 points; 2. Valentin Guillod (SUI, YAM), 259 p.; 3. Pauls Jonass (LAT, KTM), 259 p.; 4. Aleksandr Tonkov (RUS, HUS), 256 p.; 5. Tim Gajser (SLO, HON), 251 p.; 6. Jordi Tixier (FRA, KAW), 251 p.; 7. Jeremy Seewer (SUI, Rockstar Energy Suzuki), 246 p.; 8. Max Anstie (GBR, KAW), 210 p.; 9. Julien Lieber (BEL, YAM), 209 p.; 10. Dylan Ferrandis (FRA, KAW), 205 p.